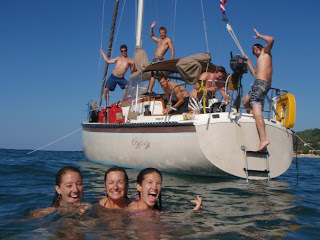 It´s a wildly exciting feeling to have the opportunity to both leave Cabo San Lucas (the $6 dollar beers left a slightly bitter taste in our mouths) and to sail 275 miles across the Sea of Cortez to meet up with some great friends from home in a sleepy little town in Mexico. Well, maybe sleepy´s not the appropriate adjective here. Sleep has never really been a big part of the gameplan in Jackson. I guess it should go without saying that the first R in R&R can´t be counted on when half of Jackson has been transplanted to Sayulita. Oh well, work hard (haha), play harder, right? 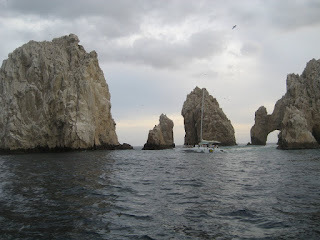 Our last view of Cabo, the famous rock arch, was a more than welcome sight when we finally shoved off. Another strangely exciting feeling (emphasis on strange) is to be attacked by water balloon pirates in the middle of the ocean! Having not seen another boat for nearly a day and a half - almost 150 miles from the nearest shore - we were suddenly under enemy fire from fellow Haha-ers J-World. And we thought we were friends! Fortunately the dousing was a welcome relief from the heat, and their attempts to steal our women and our beer were futile - we had no women and our three beers were bordering on bathwater temperature. HA! That´ll teach you pirates to mess with the Gypsy Kings! Hey hey! Remember these crazy kids? 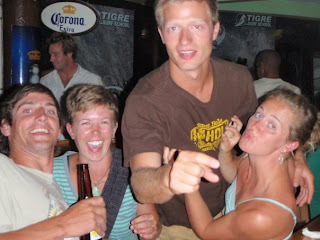 Matt and Katy from the Baja Haha were actually the first to greet us upon arrival in Sayulita. Cruising from Cabo on the Poobah´s luxury catamaran, they arrived a day or so ahead of us and were relaxing on the porch of their beachside bungalow when they saw Gypsy poking along into the bay. Must say it was a pleasant surprise to be greeted on the VHF by a familiar voice after a long sail to uncharted territory. Ahhh, dry land. Time among good friends from home. Sayulita´s famous Tacos el Pastor. Can´t get much better than that, right? Oh wait, is that a bottle of tequila in your right hand, Eddie? What, this bottle? Tequila? In Mexico? Noooo. Well maybe, for better or for worse. 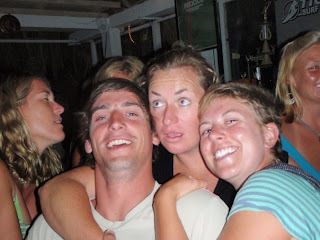 Deckhand Chad and a couple of our gracious hostesses, Amy and Katrina. 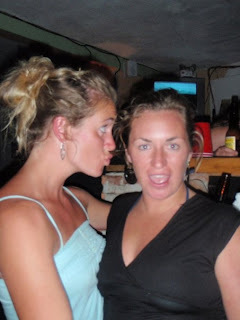 Apparently our arrival in Sayulita was a much anticipated event, and as per usual we timed it perfectly. We got into to town on what was the last night in Mexico for several of the lovely Jackson ladies, so naturally had to celebrate both their departure and our arrival. And celebrate we did. Remember that bottle of tequila? Yeah, neither do we. Don´t be scurred, Amy. Margaritas are your friends. See, Noni´s got the idea. There´s no better way to burn off the fog of last night than catching a few breakfast waves before the rest of the beach bums wake up and paddle out. Seen here, real live surfer dudes and dudette. 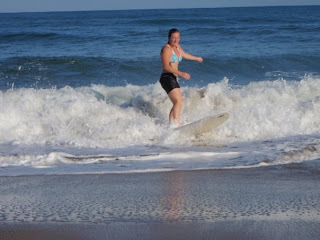 Hey Eddie, which way to some killer waves? Oh, the waves are that way. You get really hungry after surfing for two hours before breakfast. Really hungry. MMM, Sally. Pangas line the beach in Sayulita. The Sisters Jimmerson. Stay classy girls. 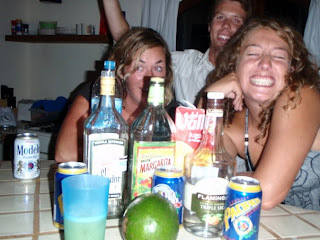 Speaking of classy, Sayulita didn´t know what it was getting itself into when it invited the Gypsy crew ashore. 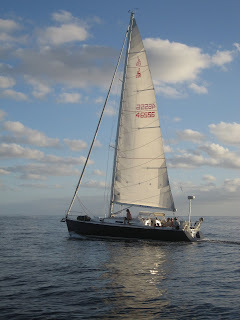 The unfortunate thing about having a sailboat is that people are constantly trying to bum rides from you to really crummy places like surf breaks, deserted islands, and golden sand beaches. Seriously a bummer. Our last day in Sayulita we decided that maybe it wouldn´t hurt to let in and bring these hooligans along to a surf spot just up the coast. Boy were we wrong! Worst day ever - you can just see the agony and disgust in our faces. 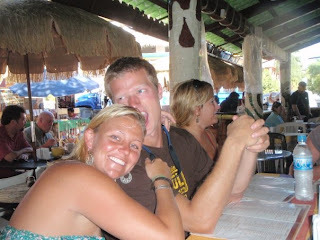 Amy and Chad struggling through another day aboard Gypsy in sunny Sayulita. 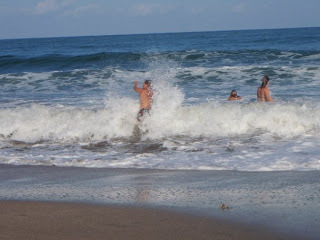 Well eventually we had to leave Sayulita and move south along the coast to Zihuatanejo. Fortunately for us we got there on Thursday and Thursdays are Pozole Days! If you´ve never tried this speciality of the state of Guerrero, it is highly recomended. A spicy stew made with chicken or pork, onions, jalepenos, hominy, and all the additional fixings you could want to make it to your liking, it is an absolutely delicious dish well deserving of it´s own weekly holiday. 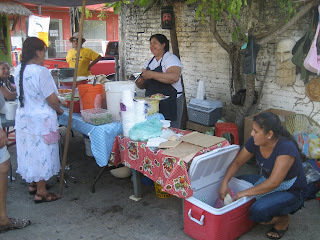 These lovely ladies serve up some of the cheapest, tastiest, and heartiest servings of pozole in all of Zihua. No reservations needed, but get there early if you want to be fed because their pozole goes fast! Right next to Zihuatanejo is a the resort town of Ixtapa, which was created by the Mexican tourism board because they thought that Mexico was in need of another Cancun style resort town on the Pacific coast. First of all, Mexico, I think one Cancun in the world is enough Cancun for everyone. And second of all if you really have to build another one at least do it right. 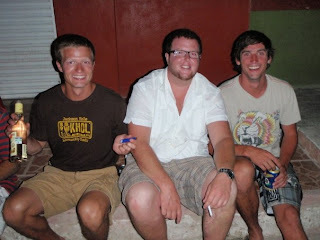 Not one wet t-shirt contest was witnessed in our stay in Ixtapa. I, for one, am very disappointed. The one saving grace for Ixtapa is that their marina is infested with giant crocodiles. Not good for swimming, but like wet t-shirt constests, fun to look at. Mexicans take their tequila seriously and so do we. Our tequila somellier, Brisa, helped us select the best tequila available with some very prudent advice: the best tequila is the one that tastes best to you. Just like wine, you can get a good sense for flavor with the nose. I´m picking up an essence of salt and lime here. Mmm, delicious. 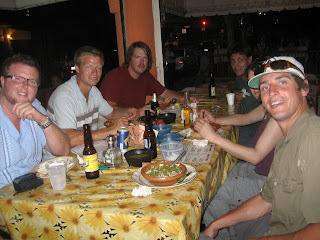 With high spirits after spending a few days in what seems to be the consensus favorite town in Mexico so far, we leave Zihuatanejo for Acapulco and then the last leg of our Mexican cruising with Guatemala, El Salvador, and Nicaragua still to come. But don´t worry, we´ll keep you in the loop. Salud!